In smart city Brussels, shared mobility is growing fast, including in its oldest form: public transport. The number of bus, tram and metro journeys continues to grow, while solutions for smart car use are also being developed. Traffic jams? In the smart city there is always more than one way to get to your destination. Technological solutions to reduce road congestion include city tolls, like they have in London and Stockholm, or real-time collection and processing of traffic data, like in Lyon. 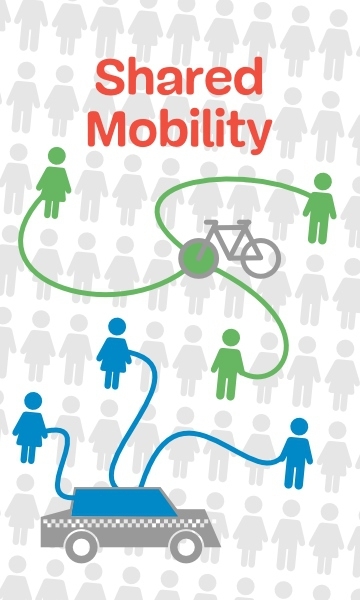 A parallel and complementary approach is promoting soft modes (bicycles or walking) and shared mobility. Public transport is the oldest form of shared mobility. Other complementary solutions have emerged in recent years. They include self-service bike sharing, car sharing and taxi-buses. All these shared transport solutions are available and increasingly successful in the Brussels-Capital Region. They help us achieve the goal of the Iris 2 regional mobility plan to achieve a 20% reduction in the number of cars on the road by 2018 compared with the 2001 figure.